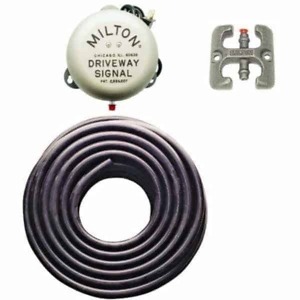 Buy rubber hose to create a driveway alarm rubber hose signal bell kit in a variety of lengths of 100′, 200′, and 300′. For customer lengths, pleaes call for details. hose length Choose an option100 ft.200 ft.300 ft.
Rubber hose for use in pnuematic driveway alarm kits. When a car or truck drives over this rubber hose, the air pressure create triggers a signal bell to sound a buzzer sound. Purchase rubber hose in lengths of 100′, 200′, and 300′ or pleaes feel free to call us for a custom lenght. 100 ft., 200 ft., 300 ft. This company is does what it says I received my order prompt.